This book has been replaced by The FOA Reference Guide to Premises Cabling as the reference for FOA CPCT Certification since 2010. 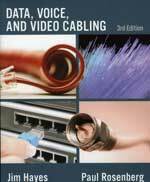 This book on data, voice and video cabling installation was co-written with well-known author and trainer Paul Rosenberg. It was developed from the Cable U training programs, Wire U and Fiber U. It is a "hands-on" book, with minimal theory and lots of practical advice. It covers both copper wiring (coax, telephone, and Cat 3 and Cat 5 LAN cabling) and fiber optics in separate sections. Each section has chapters on the basics, components, installation practice and testing. Also included is a overview of communications and information on the cabling business. If you are interested in cabling installation, you will find this book to be an invaluable reference. It includes descriptions of the hands-on processes used in installing data/voice/video cabling. If you are an instructor interested in teaching communications cabling, you will like the comprehensive instructor's guide available from Delmar for the book and the support we can supply to your organization. Numerous training programs are using this book. If you are interested in fiber optics as well as communications wiring, you may be interested in The Fiber Optic Technicians Manual also by Jim Hayes. © 2003-8, The Fiber Optic Association, Inc.